In the past summer, I had travels from coast to coast, and in many of those events were filled with drinking and late night partying. Too many drinks plus not enough sleep have given me dryness and fine lines on the eyes. The eye creams I had didn't help much with these temporary "issues". 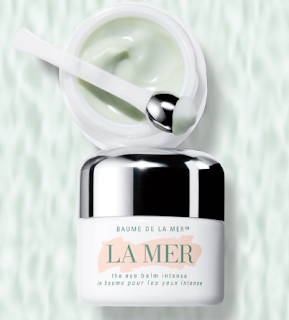 When I was worried and panic, I had the opportunity to try the latest eye cream from La Mer that was released in October 2010, called The Eye Balm Intense. The Eye Balm Intense aims for diminishing the appearance of fine lines and wrinkles, reducing puffiness and promoting firmness and clarity of the eye area. It is formulated with La Mer's The Miracle Broth™, Marine De-puff Ferment™ and Lifting Ferment™. The Eye Balm Intense is a triple concentration of The Miracle Broth, which includes Original Miracle Broth, concentrated Miracle Broth and Encapsulated Miracle Broth, to help repair the skin. Just like other skincare products from La Mer, this eye cream features La Mer's signature marine scent, which always smells clean and refreshing to me. It is in light green color, and is lightweight, soft and smooth to the touch. It applies easily and absorbs quickly without any greasy trace or sticky feel. Just shortly after the eye cream is applied, the eyes are slightly lifted up and brightened up. After one month, I am happy that it has lessened my fine lines and the appearance of puffy bags under my eyes. The skin around the eyes appears firmer, brighter and younger. Most of all, it provides long-lasting moisturization. It is worth noting that The Eye Balm Intense features a silver-tipped applicator, which helps stimulate micro-circulation for de-puffing. The applicator is especially designed to pick up the precise amount of eye cream for each application. I have been falling in love with La Mer The Eye Balm Intense since the first day I tried. The clean marine aroma of this eye cream is divine, and the amazingly silky light texture is just phenomenal. It certainly has minimized the fine lines and puffiness around my eyes. It also has noticeably lifted and firmed the skin with a sense of clarity as well as brightness. I can see myself continue to use The Eye Balm Intense! just read from another blog there is a massage that came with it. http://www.atelierbeauty.com/?p=852 do u try it together with the balm? i want get the eye balm intense too. i have bad eye bags! Apply gently to the eye area morning and evening. May be used over The Lifting Face Serum. Follow with Crème de la Mer. Also provides excellent results when applied to other vulnerable areas, such as smile lines, forehead lines and lips.